The end of last week/the slide into this week provided the world with the image of Meryl Streep eating pizza at the Oscars, and for that we must all be grateful. She probably sat through 17 Oscar ceremonies before then, just waiting for that moment. Of course, that glorious moment of junk food glory for the A-listers occupying that section of the Oscars seating chart left the rest of the audience not just craving pizza (but then again when aren't we craving pizza, amirite? 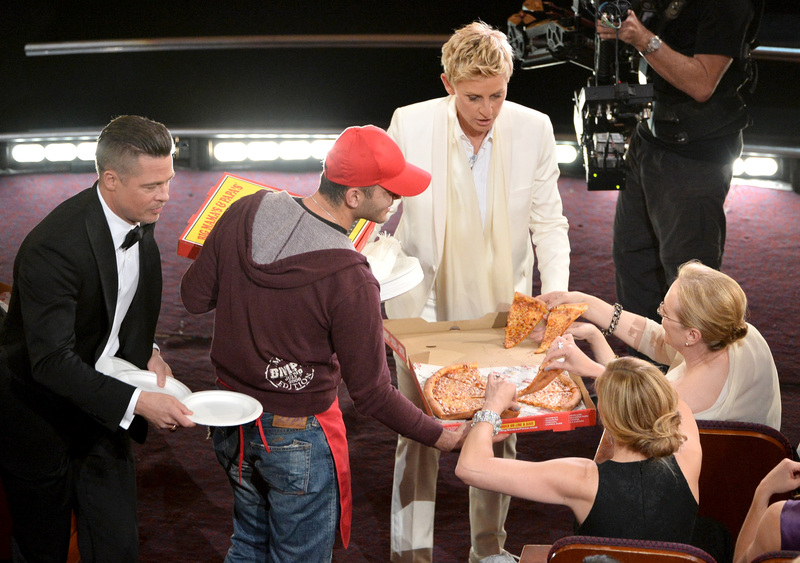 ), but with some questions: Who was that Oscars pizza guy? Was he a hired actor or more authentic? Did he know what he'd signed up for? And did he get to keep the change DeGeneres collected from the pockets of the likes of Brad Pitt and Harvey Weinstein? The pizza delivery guy went on Ellen to clear all this up for us. His real name? Edgar Martirosyan. His profession? Actual pizza guy, and also the dude in charge of the Hollywood branch of Mama & Papa's Pizzaria. Ellen (the person and the show) is apparently a loyal customer, as the show's ordered from the nearby Burbank branch before. The press has obviously been good for business, as well. While Martirosyan was on the show, DeGeneres presented him with the money she collected in Pharrell's hat — $600 total — and then threw in an additional $400 bucks of her own (or of her production budget, it's not specified), for a $1000 tip total. All in all a pretty good week for a pizza delivery dude.